License plates with oddball names like the "Kingdom of Heaven" and the "Little Shell Pembina Band," which is a fake Indian tribe that runs a redemption scam. The FBI has a brochure available for all law enforcement agencies that includes pictures of a variety of sovereign plates. 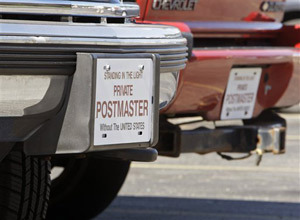 Two vehicles with no registered license plates are parked outside an apartment complex in Columbus, Ohio. Unusual use of outdated language.A simple question like, "Where are you headed?" may get you a response along the lines of,"I am a free man, traveling upon the land." An arrogant or belligerent attitude. Sovereigns believe that they have secret knowledge about a complex government conspiracy that most Americans, including law enforcement officials, are too stupid to comprehend. Anti-Federal Reserve or banking comments, even though all you are discussing is a driver's license, registration tags or traffic infractions. Anger towards other government agencies such as FEMA, the EPA, the U.S. Post Office and the Census Bureau is common. Unsolicited anti-Semitic comments,either outright or veiled. Odd punctuation of names,typically involving colons and hyphens. The absence of a zip code in adherents' addresses (sometimes, the zip code is present, but placed in brackets).